Our App - which contains some bootstrapping code. We’re now ready to add out first User Interface! So… let’s start with Android. Same as we did with the Core project, we will use a standard template to create the Android project. Also, make sure you delete Main.axml in the /resources/Layout folder. 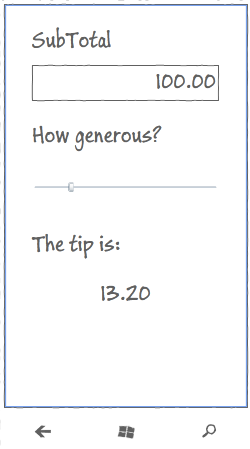 Add a reference to your TipCalc.Core project - the project we created in the first step. MvxAndroidApplication provides some behavior for initializing the framework in runtime - although it isn’t really the only way to configure the Android project. MvxAndroidSetup is the default setup MvvmCross contains. But you can use your own customized setup - sometimes it’s necessary and it’s a good place to initialize some 3rd party libraries on it. App here is a reference to our TipCalc.Core.App class. Every MvvmCross UI project requires a Setup class, but if your app is fairly simple, like the TipCalc is, then you can safely use the default one, provided by the framework. Finally, the Setup class is also responsible for initializing your App class. Luckily for us, all this functionality is provided for you automatically, unless you want / need to use a custom Setup class (since it is an excellent place to register your own services / plugins, it is often the case). This tutorial doesn’t attempt to give an introduction to Android XML layout, but any knowledge is actually really necessary at this point. If you are very new to Android, you can read more about Android XML on the official documentation. We will add a new .axml file - called TipView.axml into the /Resources/Layout folder. To the property SubTotal on the DataContext - which in this case will be a TipViewModel. With our .axml layout complete, we can now move back to C# and add an Activity, which is used to display the content. These Activity classes are very special objects on Android, which provide a context to your app and a placeholder to display widgets on the UI. Create a Views folder within your TipCalc.Droid project. Within this folder create a new C# class called TipView. public class TipView : MvxActivity<TipViewModel>"
The Android project is complete! There’s more we could do to make this User Interface nicer and to make the app richer… but for this first application, we will leave it here for now. Let’s move on to Xamarin.iOS!